There are two basic types of malnutrition. The first and most important is protein-energy malnutrition--the lack of enough protein (from meat and other sources) and food that provides energy (measured in calories) which all of the basic food groups provide. This is the type of malnutrition that is referred to when world hunger is discussed. The second type of malnutrition, also very important, is micronutrient (vitamin and mineral) deficiency. This is not the type of malnutrition that is referred to when world hunger is discussed, though it is certainly very important. No one really knows how many people are malnourished. The statistic most frequently cited is that of the United Nations Food and Agriculture Organization, which measures 'undernutrition'. The FAO did not publish an estimate in its most recent publication, 'The State of Food Insecurity in the World 2011' as it is undertaking a major revision of how it estimates food insecurity (FAO 2011 p. 10). The 2010 estimate, the most recent, says that 925 million people were undernourished in 2010 (FAO 2010). As the figure below shows, the number of hungry people has increased since 1995-97. The increase has been due to three factors: 1) neglect of agriculture relevant to very poor people by governments and international agencies; 2) the current worldwide economic crisis, and 3) the significant increase of food prices in the last several years which has been devastating to those with only a few dollars a day to spend. 925 million people is 13.6 percent of the estimated world population of 6.8 billion. Nearly all of the undernourished are in developing countries. In round numbers there are 7 billion people in the world. Thus, with an estimated 925 million hungry people in the world, 13.1 percent, or almost 1 in 7 people are hungry. Children are the most visible victims of undernutrition. Children who are poorly nourished suffer up to 160 days of illness each year. Poor nutrition plays a role in at least half of the 10.9 million child deaths each year--five million deaths. Undernutrition magnifies the effect of every disease, including measles and malaria. The estimated proportions of deaths in which undernutrition is an underlying cause are roughly similar for diarrhea (61%), malaria (57%), pneumonia (52%), and measles (45%) (Black 2003, Bryce 2005). Malnutrition can also be caused by diseases, such as the diseases that cause diarrhea, by reducing the body's ability to convert food into usable nutrients. According to the most recent estimate that Hunger Notes could find, malnutrition, as measured by stunting, affects 32.5 percent of children in developing countries--one of three (de Onis 2000). Geographically, more than 70 percent of malnourished children live in Asia, 26 percent in Africa and 4 percent in Latin America and the Caribbean. In many cases, their plight began even before birth with a malnourished mother. Under-nutrition among pregnant women in developing countries leads to 1 out of 6 infants born with low birth weight. This is not only a risk factor for neonatal deaths, but also causes learning disabilities, mental, retardation, poor health, blindness and premature death. The world produces enough food to feed everyone. World agriculture produces 17 percent more calories per person today than it did 30 years ago, despite a 70 percent population increase. This is enough to provide everyone in the world with at least 2,720 kilocalories (kcal) per person per day according to the most recent estimate that we could find. (FAO 2002, p.9). The principal problem is that many people in the world do not have sufficient land to grow, or income to purchase, enough food. Poverty is the principal cause of hunger. The causes of poverty include poor people's lack of resources, an extremely unequal income distribution in the world and within specific countries, conflict, and hunger itself. As of 2008 (2005 statistics), the World Bank has estimated that there were an estimated 1,345 million poor people in developing countries who live on $1.25 a day or less.3 This compares to the later FAO estimate of 1.02 billion undernourished people. Extreme poverty remains an alarming problem in the world’s developing regions, despite some progress that reduced "dollar--now $1.25-- a day" poverty from (an estimated) 1900 million people in 1981, a reduction of 29 percent over the period. Progress in poverty reduction has been concentrated in Asia, and especially, East Asia, with the major improvement occurring in China. In Sub-Saharan Africa, the number of people in extreme poverty has increased. The statement that 'poverty is the principal cause of hunger' is, though correct, unsatisfying. Why then are (so many) people poor? The next section summarizes Hunger Notes answer. Harmful economic systems are the principal cause of poverty and hunger. Hunger Notes believes that the principal underlying cause of poverty and hunger is the ordinary operation of the economic and political systems in the world. Essentially control over resources and income is based on military, political and economic power that typically ends up in the hands of a minority, who live well, while those at the bottom barely survive, if they do. We have described the operation of this system in more detail in our special section on Harmful economic systems. Hunger is also a cause of poverty, and thus of hunger. By causing poor health, low levels of energy, and even mental impairment, hunger can lead to even greater poverty by reducing people's ability to work and learn, thus leading to even greater hunger. Climate change Climate change is increasingly viewed as a current and future cause of hunger and poverty. Increasing drought, flooding, and changing climatic patterns requiring a shift in crops and farming practices that may not be easily accomplished are three key issues. See the Hunger Notes special report: Hunger, the environment, and climate change for further information, especially articles in the section: Climate change, global warming and the effect on poor people such as Global warming causes 300,000 deaths a year, study says and Could food shortages bring down civilization? The target set at the 1996 World Food Summit was to halve the number of undernourished people by 2015 from their number in 1990-92. (FAO uses three year averages in its calculation of undernourished people.) The (estimated) number of undernourished people in developing countries was 824 million in 1990-92. In 2010, the number had climbed to 925 million people. The WFS goal is a global goal adopted by the nations of the world; the present outcome indicates how marginal the efforts were in face of the real need. So, overall, the world is not making progress toward the world food summit goal, although there has been progress in Asia, and in Latin America and the Caribbean. Iron Iron deficiency is a principal cause of anemia. Two billion people—over 30 percent of the world’s population—are anemic, mainly due to iron deficiency, and, in developing countries, frequently exacerbated by malaria and worm infections. For children, health consequences include premature birth, low birth weight, infections, and elevated risk of death. Later, physical and cognitive development are impaired, resulting in lowered school performance. For pregnant women, anemia contributes to 20 percent of all maternal deaths (World Health Organization). Iodine Iodine deficiency disorders (IDD) jeopardize children´s mental health– often their very lives. Serious iodine deficiency during pregnancy may result in stillbirths, abortions and congenital abnormalities such as cretinism, a grave, irreversible form of mental retardation that affects people living in iodine-deficient areas of Africa and Asia. IDD also causes mental impairment that lowers intellectual prowess at home, at school, and at work. IDD affects over 740 million people, 13 percent of the world’s population. Fifty million people have some degree of mental impairment caused by IDD (World Health Organization). 1. The relation between hunger, malnutrition, and other terms such as undernutrition is not 'perfectly clear,' so we have attempted to spell them out briefly in "World Hunger Facts." 2. For example, the Oxford English Dictionary (1971 edition) has 'insufficient nutrition' as the only meaning for malnutrition. 3. For discussions of measuring hunger see Califero 2011, Headey 2011 and Masset, in press. 4. The table used to calculate this number. Black RE, Morris SS, Bryce J. "Where and why are 10 million children dying every year?" Lancet. 2003 Jun 28;361(9376):2226-34. Black, Robert E, Lindsay H Allen, Zulfiqar A Bhutta, Laura E Caulfield, Mercedes de Onis, Majid Ezzati, Colin Mathers, Juan Rivera, for the Maternal and Child Undernutrition Study Group Maternal and child undernutrition: global and regional exposures and health consequences. (Article access may require registration) The Lancet Vol. 371, Issue 9608, 19 January 2008, 243-260. Jennifer Bryce, Cynthia Boschi-Pinto, Kenji Shibuya, Robert E. Black, and the WHO Child Health Epidemiology Reference Group. 2005. "WHO estimates of the causes of death in children." Lancet ; 365: 1147–52. Caulfield LE, de Onis M, Blössner M, Black RE. Undernutrition as an underlying cause of child deaths associated with diarrhea, pneumonia, malaria, and measles. American Journal of Clinical Nutrition 2004; 80: 193–98. Shaohua Chen and Martin Ravallion. June 2004. "How have the world’s poorest fared since the early 1980s?" World Bank Policy Research Working Paper 3341 Washington: World Bank. de Onis, Mercedes, Edward A. Frongillo and Monika Blossner. 2000. "Is malnutrition declining? 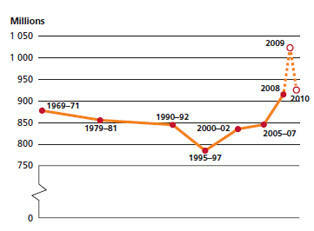 An analysis of changes in levels of child malnutrition since 1980." Bulletin of the World Health Organization 2000, : 1222–1233. Food and Agriculture Organization, International Fund for Agricultural Development, World Food Program. 2002 "Reducing Poverty and Hunger, the Critical Role of Financing for Food, Agriculture, and Rural Development." Headey, Derek. 2011. “Was the Global Food Crisis Really a Crisis? Simulations versus Self-Reporting”, IFPRI Discussion Paper 01087. Masset, Edoardo. 2011 In Press. A review of hunger indices and methods to monitor country commitment to fighting hunger Food Policy. Pelletier DL, Frongillo EA Jr, Schroeder D, Habicht JP. The effects of malnutrition on child mortality in developing countries. Bulletin of the World Health Organization 1995; 73: 443–48. United Nations High Commissioner on Refugees. 2007. Statistical Yearbook 2006 "Main Findings"